Kicks will be Nissan's newest entry in the fast-growing compact crossover market. Nissan’s compact Kicks crossover will make its Canadian debut at the Montreal International Auto Show on Jan. 18 and will arrive in showrooms nationwide in June. The new vehicle targets young couples — perhaps expecting a child, the automaker said — and empty-nesters. It made its international debut at the L.A. auto show in December. Kicks will be Nissan’s newest entry in the fast-growing compact crossover market. The automaker describes it as “the gateway” vehicle to the rest of its utility vehicle lineup, which includes, from smallest to biggest, the Qashqai, Rogue, Murano, Pathfinder and Armada. “The Nissan booth at the next Montreal auto show will be our most diverse one to date,” Nissan Canada President Joni Paiva said in a statement. The redesigned 2018 Nissan Leaf will also make its Canadian debut there. The Kicks comes with a standard 1.6-litre DOHC 16-valve 4-cylinder engine with continuous variable valve timing control system. The engine is rated at 125 horsepower and 115 lb-ft of torque. At the L.A. auto show, the automaker promised it will be priced at less than US$19,000 in the United States. 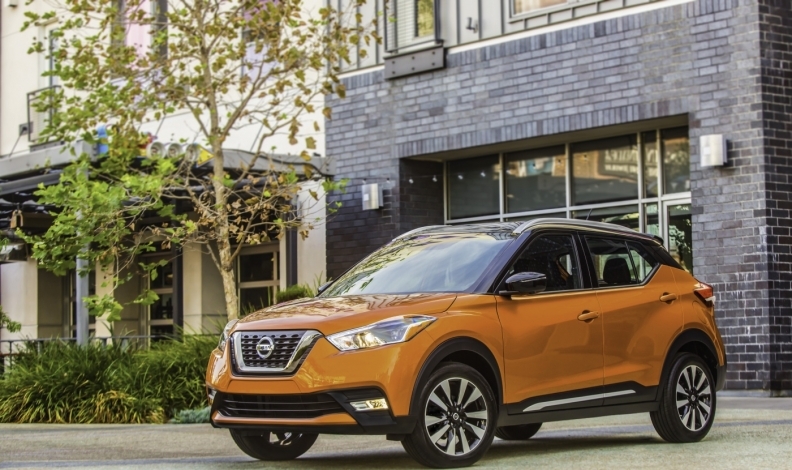 At that show, Michael Bunce, Nissan North America's vice president of product planning, said he believes the Kicks could satisfy customers who want a slightly larger utility vehicle but can't afford the payments. "Our target buyer is really the millennials, pre-family stage — singles, couples, pre-family, maybe one kid on the way," Bunce told Automotive News on the sidelines of the show. "But then also, you've got the other side of the equation when people are downsizing. They've had crossovers, SUVs and trucks and they're looking to downsize a little in retirement, but they don't want to go all the way back to a sedan just yet. So we think it'll fit that need perfectly."